Melville Estates successfully transitioned to Angela Court IRA – officially certified and open! Medford Day Hab officially opened. 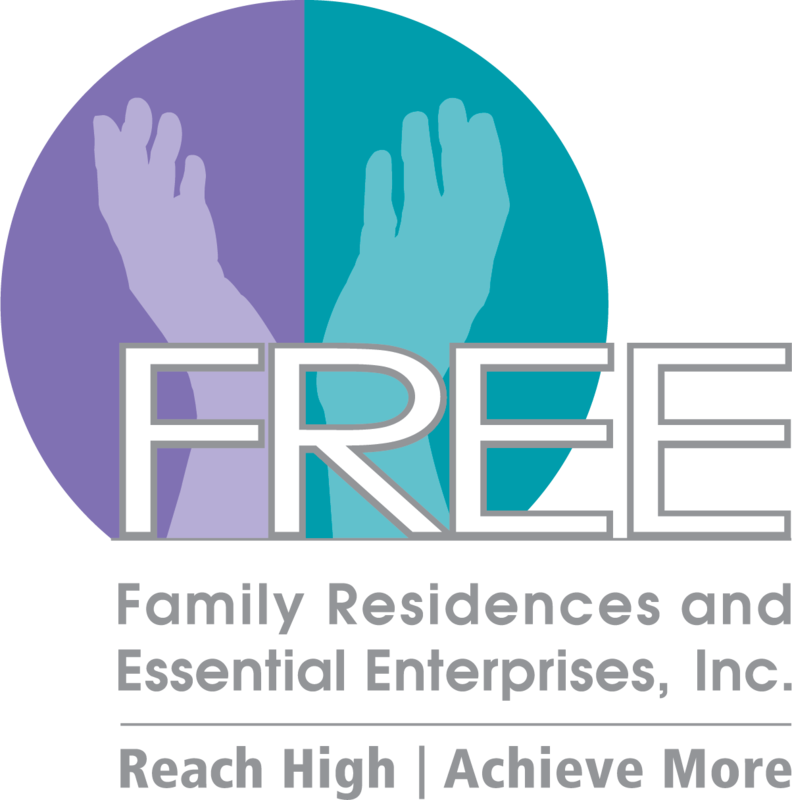 It serves as part of FREE’s Program Without Walls, which allows individuals to have access to volunteering and job opportunities in the greater community. Budd’s Bay is a recreational room made possible by a generous donation from Mickey and Reese Michaels who share FREE’s mission of keeping the individuals we serve and Team Members healthy through good nutrition and physical activity. Fancy FREE Kiosk opened at Broadway Mall in Hicksville where we sell a variety of gift items emblazoned with artwork created by the artists at FREE. In addition, many of the artists will be at the kiosk to help sell their products to the public. The mobile farmers market will travel to destinations in both Suffolk and Nassau County, providing fruits and fresh vegetables for purchase to low-income communities across Long Island, who may not otherwise have access to health locally grown produce. FREE hosted a luncheon to honor the One Year Anniversary of Speaking FREE with Chris and Robert with Past radio show guests and enjoyed the day as we reflected on the incredible year of empowering those we are so privileged to serve. The NY START Team celebrated their one-year anniversary of being in operation by participating in a special team building exercise. All team members look forward to more fun and exciting challenges in the future. FREE awarded Top Workplaces honor by Newsday. The list is based solely on employee feedback. Being named a Top Workplace is a big deal — only 74 companies made this year’s list. Twenty-nine Long Island business leaders were honored at Long Island Business News’ Executive Circle Awards luncheon. Dr. Christopher D. Long, President of FREE, received the award for his dedication to mentoring youth, and implementing many programs to help them perform academically and socially to realize their full potential. The ANCOR Foundation Legacy Leaders Circle honors the finest and most influential leaders and celebrates the accomplishments of long-term ANCOR members who made significant contributions to ANCOR during his/her tenure as a member. It is with great pride that we announce that Robert S. Budd, CEO of FREE, was one of the recipients of the 2018 ANCOR Legacy Award. Rebecca Geiger and Edwin Gomez were honored at this year’s New York State Association of Day Services Providers Star Awards Ceremony. Erin, from FREE’s Speakers Bureau, received a certificate from Suffolk County Legislator Tom Donnelly. A group of our Individuals from the Speakers Bureau were recognized by Donnelly for their advocacy efforts. FREE’s Valued Team Members, Self Advocates, Family Members and allies have been making their voices heard! Throughout the year they have met with government officials locally in Albany and Washington DC to advocate on issues that directly impact the individuals we are so proud to serve. It is imperative, now more than ever, to stand strong together and make our voices heard and as a result we are actively involved the We Have a Stake Campaign (Included. Empowered. Supported. ), Bring it Home, and#bFair2directcare Campaign. We were involved in rallies in Albany, New York City and Long Island! A Busy Year for FREE’s Performing Arts! FREE Players Ensemble perform for Veterans at Nassau Coliseum, perform for Smile Farms at Citi Field, perform at MacArthur Airport to name a few. FREE Players Drum & Bugle Corps perform at Drum Corps International, perform at New York Open Nassau BOCES Rosemary Kennedy School, Pay Special Tribute toGeorge HW Bush and many more events throughout the year! Theatre Day Hab Introduces its Newest Group, FREE Spirit cheer team that brings happiness to everyone. Skills Unlimited, Inc., an affiliate of FREE, offering vocational training programs for adults with disabilities, is proud to announce the opening of their Veterans’ Garden at their headquarters in Oakdale. Members from Pronto held a Meet and Greet at the Brentwood Country Club. The evening started off networking, followed by a panel discussion on issues impacting local communities, including immigration, gang violence/safety, addictions and more. This event was a great way for Pronto to receive feedback from local members of society on how to better the communities they live in. Doubled Transition to Work enrollment year after year. Nassau County District Attorney program awards TRI embroidery machines and partnered to embroider over counterfeit goods that were delivered to the homeless. Adelante is awarded their first ACCES-VR CRS Contract. © 2019 Family Residences and Essential Enterprises, Inc.